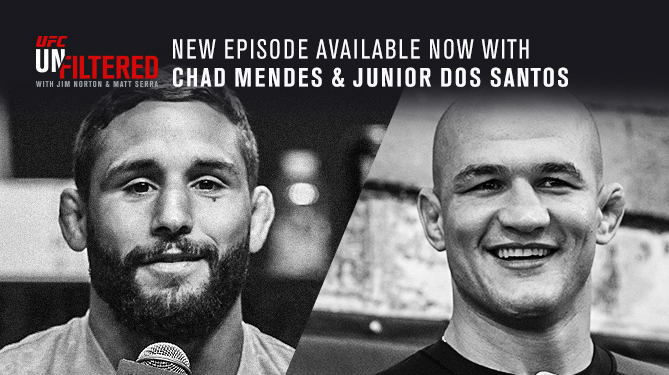 First, Chad "Money" Mendes calls in and discusses his return to the Octagon after two years away, what he did during his USADA suspension, fighting Myles Jury in Boise, Idaho, TJ Dillashaw vs. Cody Garbrandt 2, and more. Then, former UFC Heavyweight champion Junior dos Santos joins the show and talks about being flagged, and eventually cleared, by USADA, returning to the Octagon against former WSOF Heavyweight champion Blagoy Ivanov, the mental side of fighting, DC vs. Brock, and a lot more. Finally, the newly-minted UFC Hall of Famer Matt Serra calls in from Las Vegas to make his picks for UFC Boise. Plus, Jim and Chris the Producah talk about Francis Ngannou's comments about his performance against Derrick Lewis at UFC 226, and Stipe's message to DC.